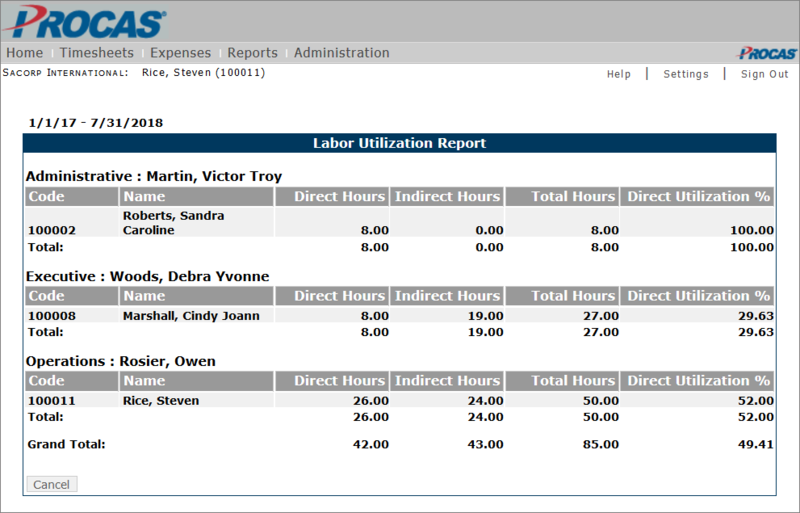 PROCAS Time & Expense has a wide variety of reports to offer. These reports span from showing who has requested PTO, to checking if employees are logging their time daily, to direct labor utilization. The four reports we receive calls asking about the most are the labor utilization, PTO authorization, labor hour summary, and floor check reports. All these reports can be accessed through the Administration or Approvals menus in PROCAS Time. You can select date ranges, tasks, accounts, or even employee approval groups to search by from the parameter screen. At the bottom of the parameters are options labelled “Direct hours/Total hours” and “User defined base hours.” If you select “Direct hours/Total hours”, the report will show a direct utilization percentage that is calculated by dividing the number of direct hours an employee worked in the selected time period by the total amount of hours worked in that period. The user-defined base hours selection defaults to 2080 hours (the total standard work hours in a year) but can be changed to a custom amount. This selection will calculate the direct utilization percentage by dividing the direct hours worked by the base hours entered. A great place to find out how much PTO the employees of your company have is through the PTO authorization report. It can be accessed through the Administration or Approvals menus --> Paid Time Off Request section --> Reports subsection --> “PTO Authorization.” You can select what date to run the report through as well as task, account, and approval group. Once you’ve run the report, you can see each employee, organized by approval group, and all their information regarding PTO including budgeted hours, PTO hours used, and PTO hours remaining. This report also has the option of being exported to a .csv file on the parameters screen. This report has similar parameters to the previous ones, but there is an additional “Hours Threshold” option. In this field, enter the number of hours you expect employees to work during the range of time selected. When the report is created, any employee that worked over the threshold value will be shown. The variance column will show how many overtime hours these employees worked. You can choose to View Details for more information about their time charges. Select the date you would like to perform the floor check for and fill out other optional search parameters. On the next screen, you will see each employee that has not yet filled out time on the chosen day. The report will also show the PTO status if they have submitted a PTO Request for that date (pending approval, approved, disapproved, or blank). There is also a check box next to each employee that, if checked, will send an email notification to the employee reminding them to fill out their timesheet for the day. These are just a few of the many helpful reports PROCAS Time features. 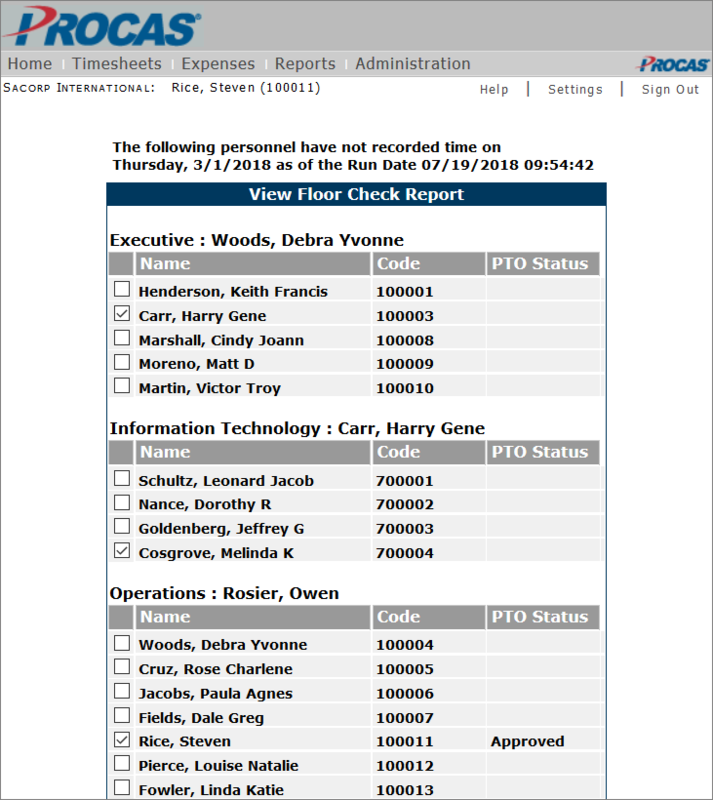 Should you have any questions about specific reports you see, or are wondering if there is a report for a function you need, please contact us via email at support@procas.com or by phone at (410) 730-4011 option 2.